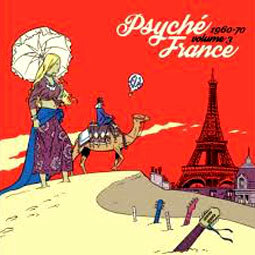 "Including 12 tracks, this third volume of the Psyche France collection is a new tribute to the mavericks and masterminds of the 1960�s and 70�s French music scene. Back then, brave artistic directors would sign leftfield acts in order to rival the British Kings of progressive rock and the new wave of US psychedelia..." ........ Track List A1 Les Masters - Mon Chameau A2 Komintern - Elle etait Belle A3 Rado Testen - Wendy A4 Triangle - Bungalow A5 Guy Skornik - La Route A6 Jean-Pierre Castelain - La Petite Auto A7 Jacques Filh - La Petite Difference B1 Papillon - L'Air Que Je Chante B2 Michel Zacha - La Dame Nue B3 Philippe Farre - Les Aiguilles Du Temps B4 Patrick Roche - Crepuscule B5 Igor Wakhevitch - Rituel de Guerre Des Esprits de la Terre . Official Record Store Day 2017 release. This product was added to our catalog on Wednesday 25 April, 2018.